The CHAMFER command makes mitered (angled) corners, like the one below. 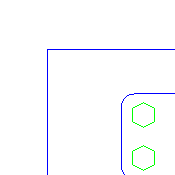 However, you can also use the CHAMFER command to extend lines to meet and make right-angled corners. In other words, you can use the command to turn the situation on the left to the situation on the right. You do this by setting the Distance and Angle options to zero. In this example the Distance option (which shows as Length) is 1 unit, and the angle is 45°. To create a square corner, use the Distance option and set both distances to 0. (You can specify a chamfer with two distances, rather than with a distance and an angle.) Then use the Angle option and set its value to 0. 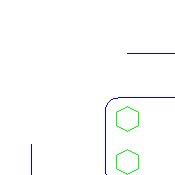 Then select both lines near their endpoints to get a square corner. But that’s a lot of setting. Instead, you can quickly and temporarily override any non-zero settings by selecting the first line, and then pressing Shift as you select the second line. Presto! Instant square corners. You could also use the EXTEND command (or the TRIM command with the Shift key), but the CHAMFER command is faster. Auto lite……I trying to extend a line that is a angle line, how do I this???? In command chamfer while using Distance and Angle. The value for angle was automatically subtracts with 360. Why? Ex. when the value entered as 45 means, it came as 315. Please give solution for me.